Top Photo: The front of Prague's Kotva Department Store offers a catchy play on words. "Vánoce na šišku" translates literally as "Christmas on a pine cone," but could also mean "Christmas turned on its head." 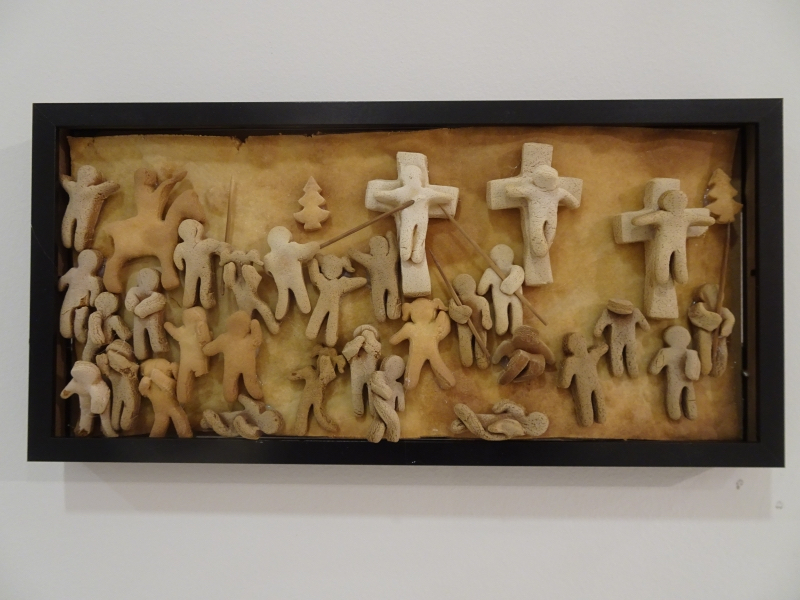 Meantime, the plunging gingerbread men hint at a darker holiday art exhibition lurking inside. Photo by Mark Baker. 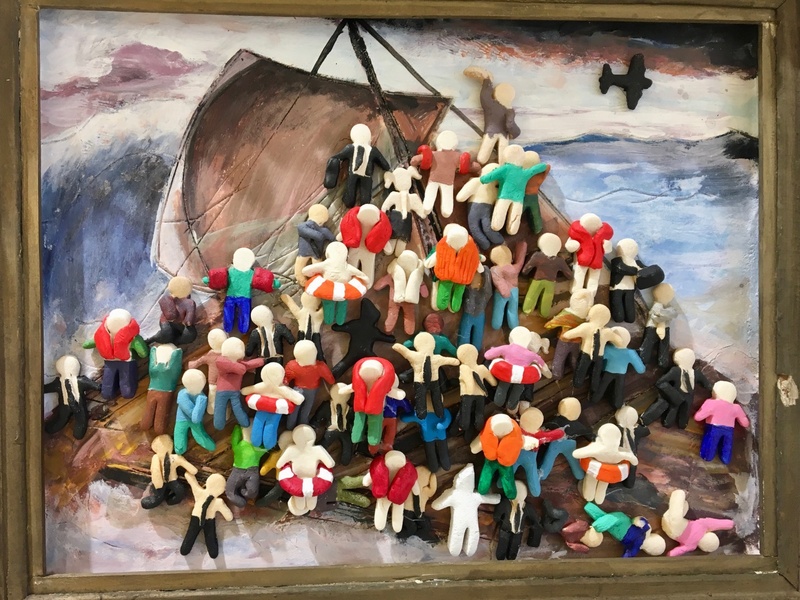 Posted in Diversions, Life In Prague and tagged art, Christmas, contemporary art, cookies, Czech, Czechia, diversions, humor, kotva, modern, Prague. Well, you can't say the artist doesn't have a point here. 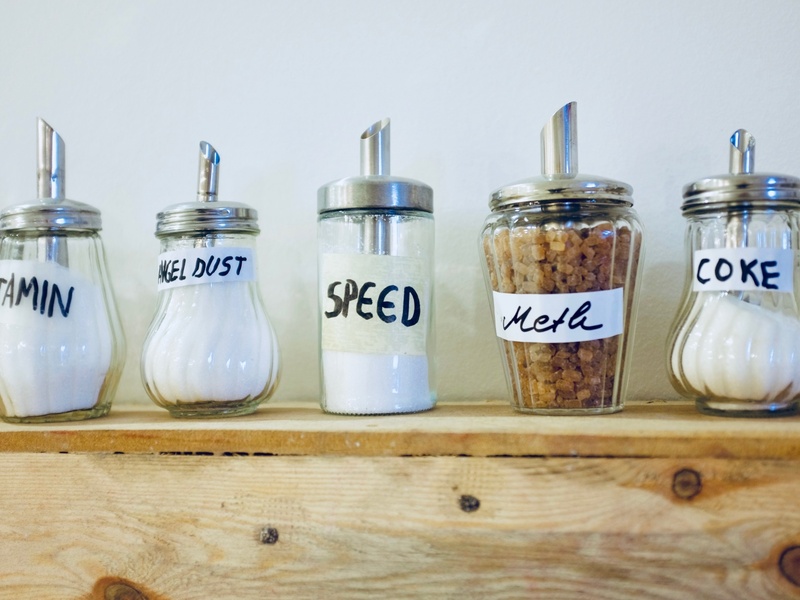 Sugar depicted as angel dust, speed, meth, and coke. Photo by Mark Baker. 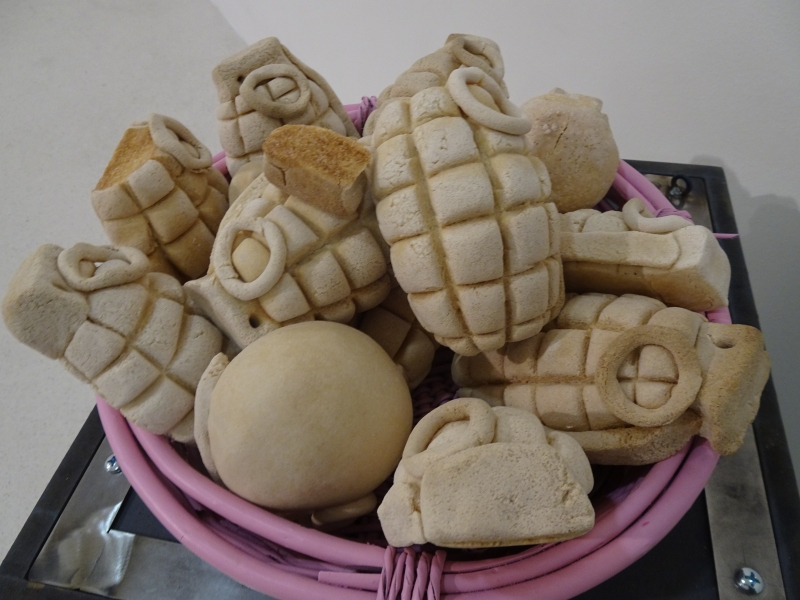 Cookies fashioned into the shape of grenades. Happy Holidays everyone! Photo credit: Martin Fryč. Santa's skeletal remains -- the victim of too many Christmas decorations?? Photo by Mark Baker. 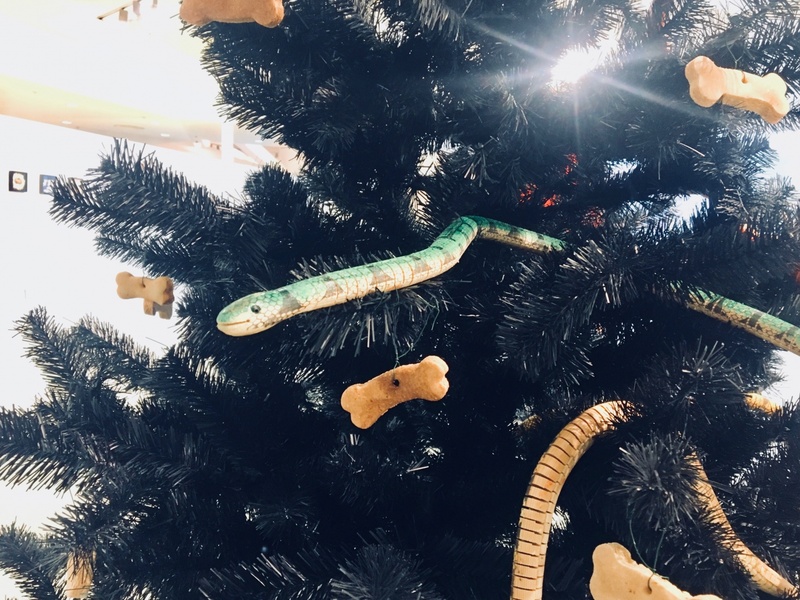 A snake slithers out of the beautifully decorated Christmas trees on display. Photo by Mark Baker. I like the Christmas holidays as much as the next guy. It usually takes me a little while to warm up to the spirit, but once I’ve indulged in a couple of cups of hot wine on Prague’s Old Town Square by early December, I start to feel the festive mood. The November gloom suddenly lifts and, for a few weeks at least, I feel like a kid again. The part about Christmas, though, that rarely cheers me up (and usually just depresses me) is the commercial side. I try to avoid stores and malls at any time of year. During Christmas, though, when shopping centers are stuffed with people -- and filled with phony, plastic tat and canned holiday music ("Have a Holly Jolly Christmas" is an earworm that actually hurts) -- I’d literally rather be anywhere else. I know this is not such a radical position. Everyone shares this sentiment, at least to a small extent. We also understand, I suppose, that department stores and businesses rely heavily on the end-of-the-year holidays for a substantial amount of their annual revenue, and we accept (and expect) the excessive over-hyping as part of that model. So, imagine my surprise as I was walking around Prague's Kotva Department Store (see map plot, below) this past week and stumbled into an exhibition that not only refuses to indulge in the typically cheery, pre-Christmas bluster, but also aggressively pushes back on it. A familiar refugee photo theme, but this time the new arrivals appear to be Western tourists. Photo by Mark Baker. Oh dear. These are certainly not your mother's rolling pins. Photo by Mark Baker. 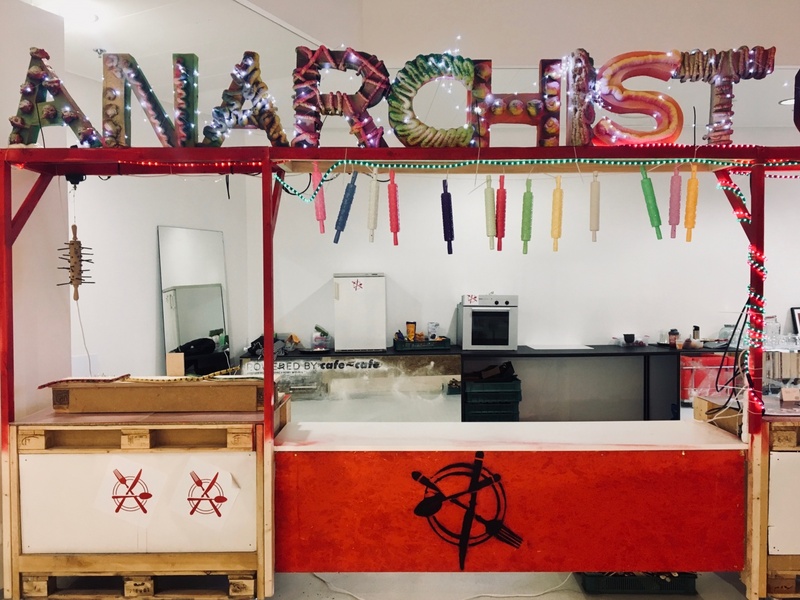 The Anarchist Cookie booth at Kotva, where you can learn about the exhibition and pick up some cookies to enjoy while you view the art works. Photo by Mark Baker. Edvard Munch is the inspiration for this cookie-lover crowd-pleaser. Photo by Mark Baker. 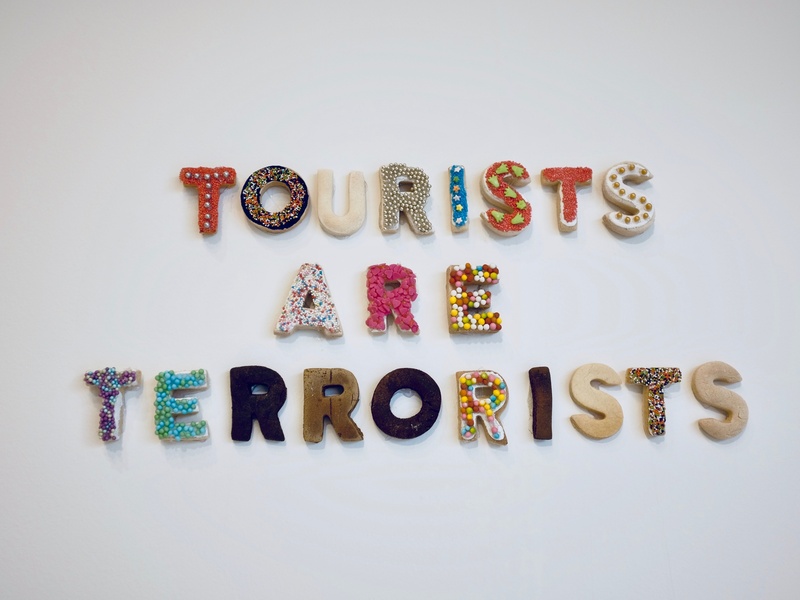 Czech-Canadian artist Marek Schovánek’s “The Anarchist Cookie Shop” is a kind of anti-Christmas holiday exhibition, where Christmas trees are presented upside-down and decorated with snakes and syringes. 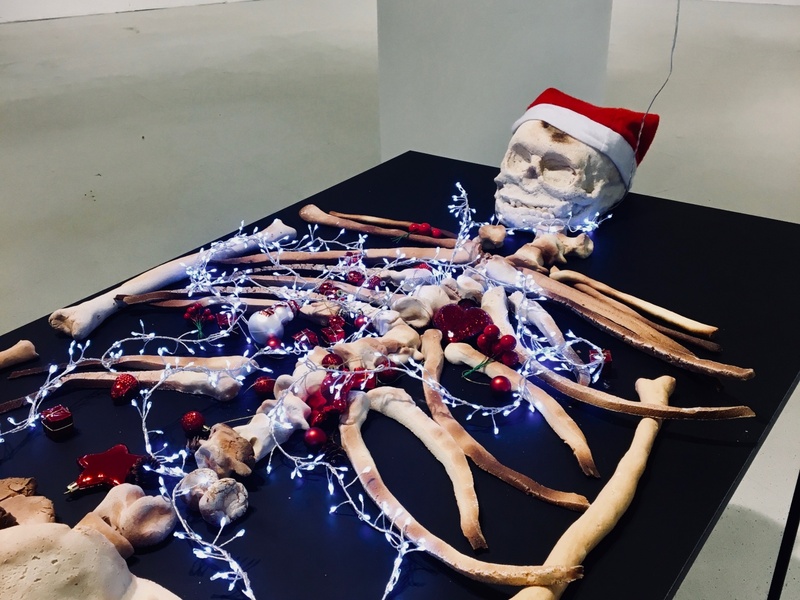 Santa’s skeleton lies in repose, his innards eaten away by holly berries and strings of Christmas bulbs. 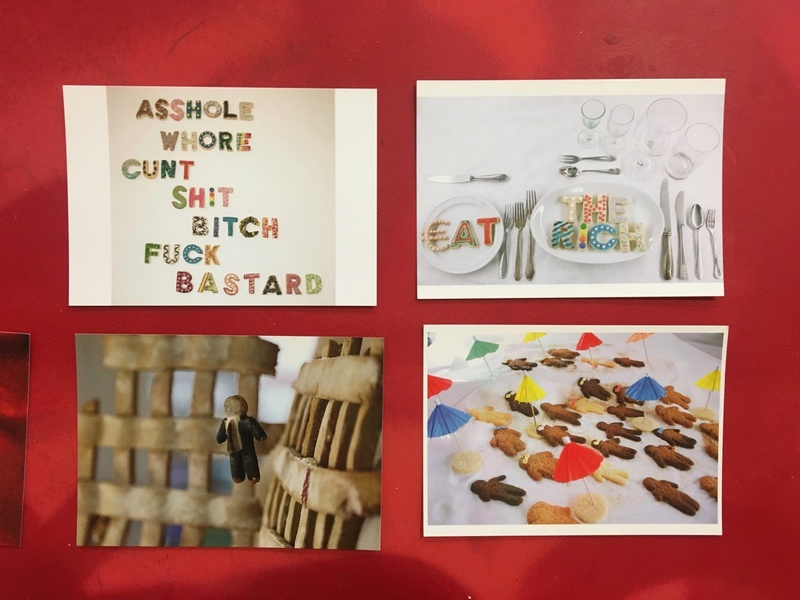 Christmas cookies (which you can get and eat on site) are shaped like guns and grenades; sugar itself is “crack cocaine.” And instead of the usual upbeat greetings like “Merry Christmas” or “Happy Holidays,” Christmas cards convey strings of words so profane that I hesitate to list them on this blog. 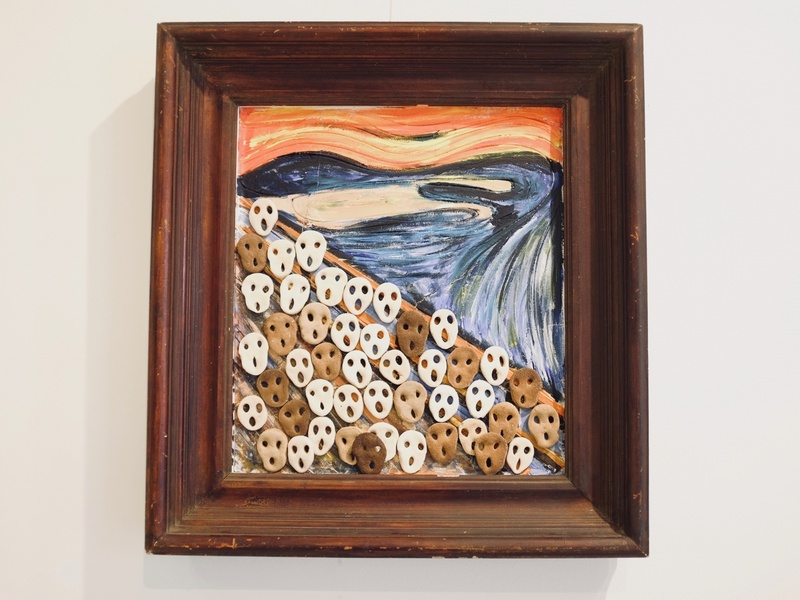 Not all of the paintings, objects, and cookies on display deal with overtly holiday themes. 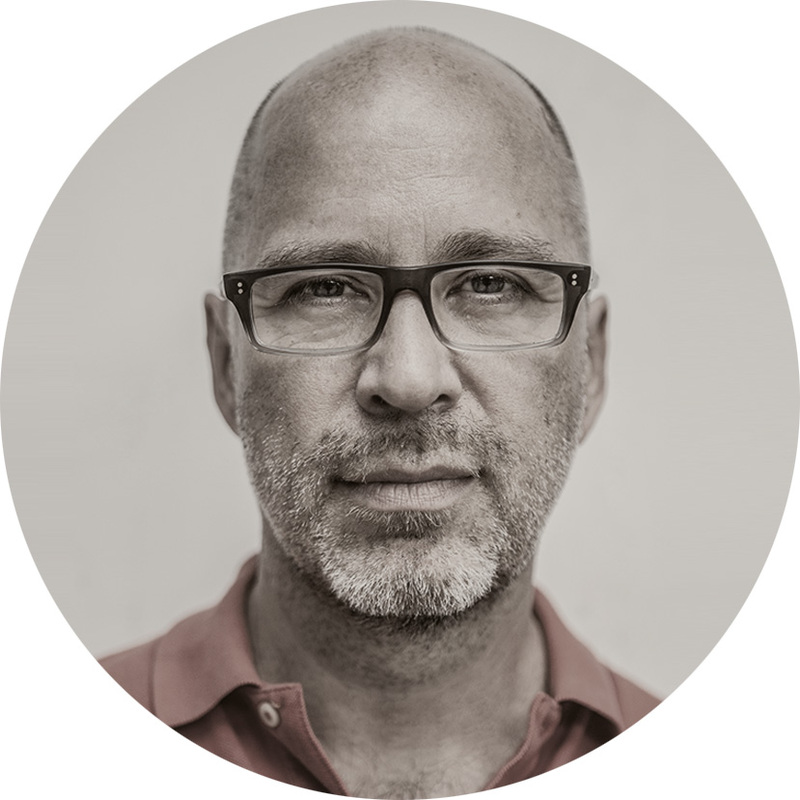 Several reflect Schovánek’s preoccupation with wider societal ills like gun violence, overtourism, and rampant technology. I’ve posted a few of my own photos of the exhibition here to share a bit of the flavor. A respected Czech blogger on contemporary arts, Martin Fryč, also paid a visit. Here's a link to his commentary (in Czech) and photos. Some of the text below has been adapted from Fryč’s observations. It took a moment to process all of it, and then I burst out laughing. Czechs are well known for having a dark, but richly ironic sense of humor. They relish in the opportunity to smash cherished myths and to prick oversized egos. 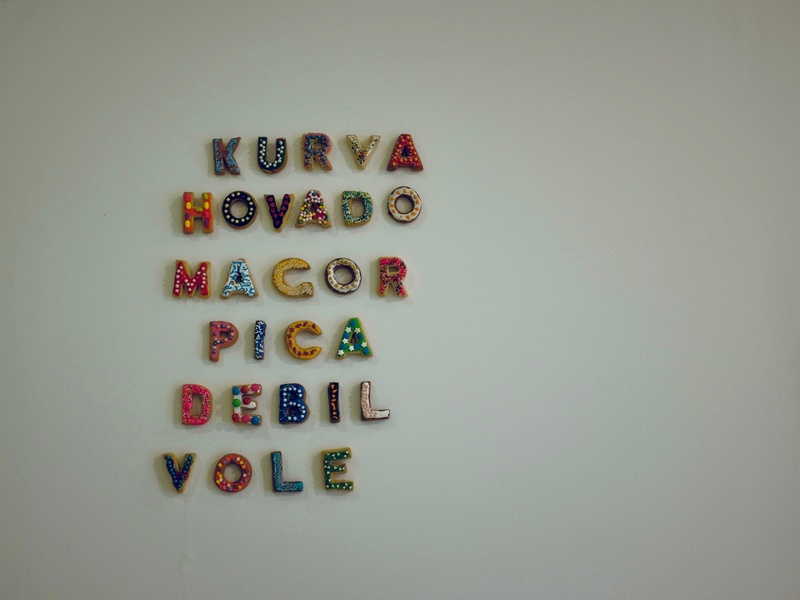 The brilliance of Czech installation artist David Černý draws on this tradition (I intend to look more deeply into Černý’s art in future posts). The Kotva exhibition pulls from the same nihilistic (or refreshing, depending on your point of view) cultural impulse. It's odd for a department store to lead the way, but our over-hyped, pre-Christmas shopping frenzy probably deserved to be taken down a peg or two. Despite the big sign on the front of store, I noticed that Kotva’s website doesn’t mention the exhibition. This plus the location of the exhibition, at the back of the story in a little-used display area, leads me to wonder if perhaps not everyone at the department store was entirely on board with the anti-holiday-shopping vibe of "Anarchist Cookies." While I too question the wisdom behind the show (given the importance of buying to the store’s bottom line), I do appreciate the spirit. “Anarchist Cookies” is scheduled to run though January 6, 2018, at the Kotva Department Store, located in central Prague at Náměstí Republiky 8. It’s on the store’s 3rd floor, though housed off to the side and a little hard to find. The exhibition is open daily from 9am to 8pm, and free to enter. Words you're not likely to find in any decent Czech dictionary -- and I won't be translating them here. Merry Christmas! Photo by Mark Baker. Tourism is never far from everyday consciousness in Prague, but this does seem to be an ill fit for a Christmas show. Photo by Mark Baker. The Anarchist Cookie booth offers shoppers a tempting array of attractive greeting and post cards. Photo by Mark Baker. The commercialization of the Holy Lands appears to be the target here. Right? Photo credit: Martin Fryč.